One of our ongoing projects here at Feed Me…I’m Hungry is our ‘World Food Tour’ where we take time to find out more about culture and food from around the world by exploring recipes, cookbooks, memoirs and more. Right now we’re enjoying the fine food of France. I’ve been bitten by the spring bug. In Colorado you never know if the weather is going to stick, but at least for now it’s been sunny, warmer, sping-ish. And the it’s given me an itch to organize things. My kids got up early this morning and I used the extra awake time to clean out the freezers. (I have a chest freezer in addition to the one on top of my fridge. Old school fridge, I know.) The need to get the freezers organized had been nagging me, always just there in the back of mind. (Yeah I’m weird like that. I think about my freezers entirely too much.) I’ve been frustrated because I didn’t really remember what I have in there. I don’t know if I need to buy more meat when I go grocery shopping, or have a tupperware of leftovers of some favorite dish tucked in the back that I could pull out and use up…. But until this morning I just couldn’t get myself motivated to get the task done and figure it out. But my freezers are now spick and span! I do in fact need to buy some more meat. And I do not have favorite leftovers hidden in the back. Actually I had a freezer epiphany. I do not, in fact, freeze favorite leftovers. There never are leftovers of favorite dishes. We eat them all. What I do freeze is weird stuff. Experiments that didn’t come out quite right, mistakes where and the lid of the spice jar popped off while seasoning and the entire jar of turmeric ended up in the pot… You get the idea. I freeze things we don’t want to eat, but I feel guilty getting rid of, because I hate wasting food. I feel like I should have wonderful prepared things in the freezer to eat because my Mom and Grandma always do. They taught me the trick of making double or triple of things and freezing the extra so that a week or two later you can pull them out and have a healthy homemade dinner to serve but not have to actually cook. A brilliant strategy right? But one I’ve never seemed to master. As I said I freeze weird stuff… and it languishes in my freezer for eternity. Or at least spring. I feel like I’m on such a spring roll (haha) here with the freezers. I might clean out my makeup drawer next. I have a makeup drawer, but only wear makeup about three times a year. Seems a little silly right? Most of my makeup is at least 6+ years old… from back in the day when I felt like I ought to wear makeup. Does makeup expire? Either way it might be time for a purge. I’m having another epiphany here! I’m kind of a hoarder. (Not like a piles everywhere type of hoarder, but a keep things I won’t really use, because I hate the thought of buying something twice or wasting things kind of hoarder.) But I’m a secret minimalist! Have you ever read Miss Minimalist? So inspiring! I don’t think I’m meant to be as much of a minimalist as she is, but it does sound freeing not to have so much stuff to look after. I don’t want to spend all my time being a care taker to my stuff. Another effect I’ve noticed from the spring bug is the desire to get myself fixed up. After my freezers this morning I went out and sprung for a few new tee shirts in fresh colors. I love fashion and could totally be a clothes horse. But I’m trying to keep my spending in check and don’t go clothes shopping very often. Plus if I’m honest about my reality I 99% of the time live in a comfy (but hopefully cute and flattering) tee shirt and jeans. Its the easiest thing to get flour out of! Or the most reasonable to replace when stained with grease, little boy mud, grass, or whatever…. So anyway, a few pretty new tee shirts for me today. And I think it’s time for a haircut. Maybe break out some nail polish. Today has actually turned into quite the project. So I’m feeling like I should share an easy spring dish with you. Balance you know? 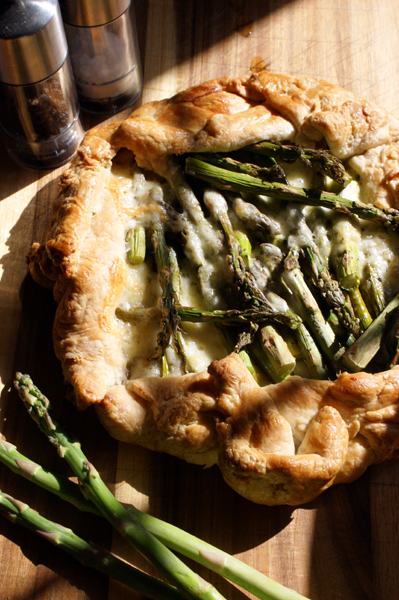 Hence today’s lovely springy galette. Once you have the crust on this one the rest of the recipe is some quick chopping and no fuss assembly and toss in the oven. Meaning this is something that you can toss together after your day of spring cleaning/organizing/shopping! I should mention that today’s specific galette recipe is not an ‘official French recipe’ but more of a variation on a French classic. I feel like this is very done in France. French cooking often involves working with the fresh vegetables of the season to make an appropriate variation on a classic. 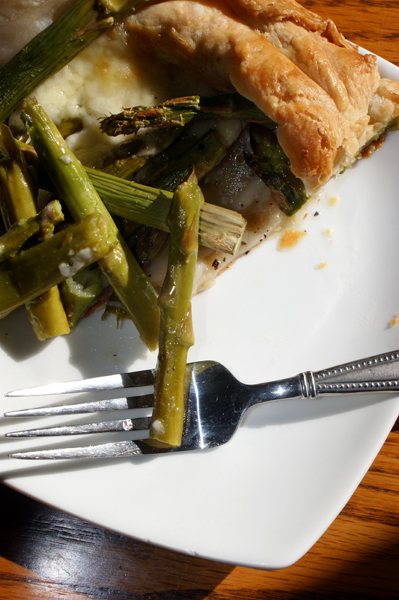 Of course spring is asparagus season, hence it’s presence in the galette. Even in Colorado I’m finding high quality asparagus for 98 cents a pound which is a really really good price here. The other major ingredient today is cheese. I used Havarti which is one of my favorites right now, though I’m not sure it is a particularly French cheese. You could also use Brie or any other mild creamy cheese. 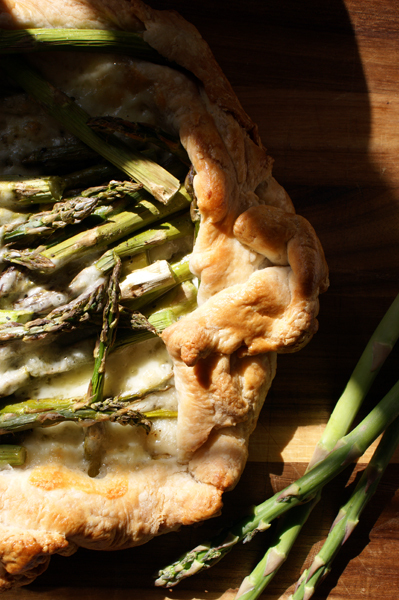 The goal is to add the cheese flavor without overpowering the asparagus. And after that we keep it simple (see I did promise not too complicated) a little sea salt and pepper and you are good to go! So go defrost or whip up some pie crust and go organize already, dinner is covered. 1. In a large preferably high sided mixing bowl use an electric mixer to lightly cream the butter. Add all dry ingredients to the bowl. Very lightly blend butter and dry ingredients with the electric mixer. 2. Add the cream and blend until mixed using the electric mixer. Do not over mix. 3. Take the dough from the bowl and gently compact a ball. Tightly wrap ball in plastic wrap and place in the fridge to chill. Chill dough between 30 and 45 minutes before rolling out. 1. Using a rolling pin roll the dough into a large circular shape. This doesn't need to be perfectly round nor do the edges need to be neat, think rustic. Dough should be 1/8 inch or so when rolled out. 2. Transfer the sheet of dough to a parchment lined backing sheet. Fill the center of the dough with asparagus spears, layering as needed to keep a generally circular shape to the filling. Sprinkle the cheese cubes around the asparagus evenly. Lightly sprinkle sea salt and black pepper. 3. Fold the edges of the dough up around the filling leaving an open center. Be sure the edges of the dough are sealed together. 4. Whisk together egg and splash of water. Brush lightly on the outside of the galette crust, this will help browning. 5. Bake at 350* for 40-45 minutes until crust is golden brown. Serve hot.